The Russian socialist movement divided on November 16th, 1903. The 57 delegates to the Second Congress of the minuscule, quarrelsome and apparently ineffectual Russian Social-Democratic Labour Party assembled in a flea-ridden flour warehouse in Brussels on July 30th, 1903. Georgi Plekhanov, the respected veteran Russian Marxist, was elected chairman, but the delegates felt uneasy in Belgium and moved to London, where the authorities could be relied on to ignore them. Their sessions were held in an angling club with fishing trophies on the walls and in rooms in pubs and cafes. The meetings were extremely fractious, with much violent argument, barracking and interminable hair-splitting as every tiny point was dissected and analysed. It became clear that the party was split between two groups, the Bolsheviks (‘majority’) and the Mensheviks (‘minority’). The Bolsheviks claimed the name after getting their way in a wrangle over the editorial board of the Party newspaper Iskra (‘the Spark’ – which was to ‘start a big blaze’). The Mensheviks unwisely accepted the appellation, though they were actually more often in the majority. Both groups were enthusiasts for the destruction of capitalism and the overthrow of the Tsarist regime, but the Mensheviks, led by Martov, favoured a large, loosely organised democratic party whose members could agree to differ on many points. They were prepared to work with the liberals in Russia and they had scruples about the use of violence. The Bolsheviks, led by Lenin, were hardline revolutionaries who would not have known a scruple if it bought them a drink. Lenin, who was now 33 (Martov was 29, Trotsky 23), had started Iskra in collaboration with Plekhanov in Munich in 1900 and he was the principal editor of the paper, to which he, Martov and Plekhanov were the main contributors. The congress decided to set up a central committee, which would oversee a new party council and a new editorial board of Iskra. Lenin was determined to gain complete control of this apparatus and succeeded in getting three Mensheviks thrown off the Iskra board. 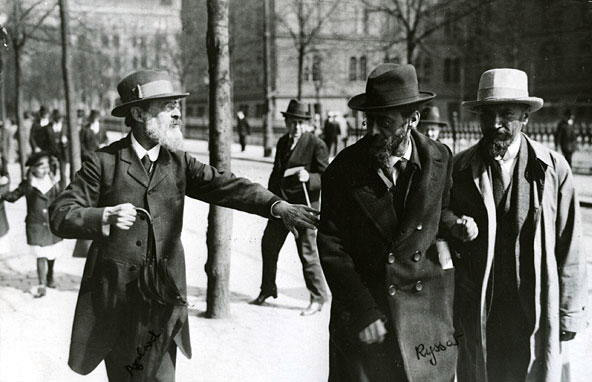 At this Martov angrily withdrew from any further involvement with the paper, leaving Lenin for the moment in command. The congress ended on August 23rd, and on the following day Lenin, who knew London pretty well, took some of the delegates to the Natural History Museum and the Zoo, followed by a respectful visit to Karl Marx’s grave in Highgate Cemetery. Lenin’s triumph soon turned to humiliation. At a conference of the party’s Foreign League in Geneva at the end of October Martov launched a devastating personal attack on him. The meeting had a built-in Menshevik majority and Lenin, who had tried to prevent it being held and then unsuccessfully to pack it, stormed out of the room and slammed the door behind him. On November 16th he announced his resignation from the editorial board and the party council. Iskra was henceforth a Menshevik organ. The split was now irrevocable. All attempts to mend it broke on Lenin’s intransigent hatred of the Mensheviks and he concentrated on creating an efficient machine for his obedient followers, with fateful consequences.